BELIZE CITY, Mon. 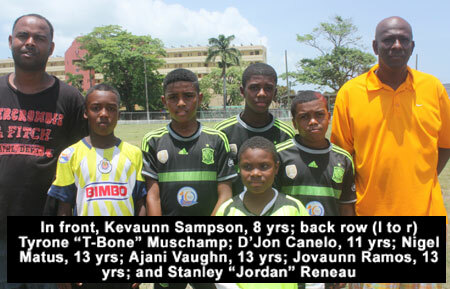 July 27, 2015–Leaving the Philip Goldson International Airport yesterday en route to Miami, Florida were five young footballers from the Smart Summer Camp and recently completed Smart 13 & Under Football Tournament 2015. The young players were accompanied on the trip by Smart Summer Camp and Football Tournament coordinators Stanley “Jordan” Reneau and Tyrone “T-Bone” Muschamp. The Bescola Camp will run from today, Monday, July 27 until Friday, July 31. The players are Ajani Vaughn from Face of Belize, D’Jon Canelo from Ladyville Jaguars, Kevaunn Sampson from London Strikers, and Nigel Matus and Jovaunn Ramos from Brown Bombers. Last year, three players from the Smart Summer Camp attended the FC Bescola Camp in Florida.